The 75th Golden Globes red carpet was less red than it was black. Both women and men attended the awards in black to protest the sexual misconduct happening in Hollywood. Brought up by the allegations against movie producer Harvey Weinstein, there have been many allegations of sexual harassment and assault against men in Hollywood and other industries. The movement was created by the new organization Time's Up, an initiative to eradicate sexual harassment and gender inequality in the workplace along with the creation of a legal defense fund. The group has raised over $15 million already for the fund, and the number is only increasing. Time's Up also supplied pins to be worn on the red carpet and almost every attendee showed up in black. 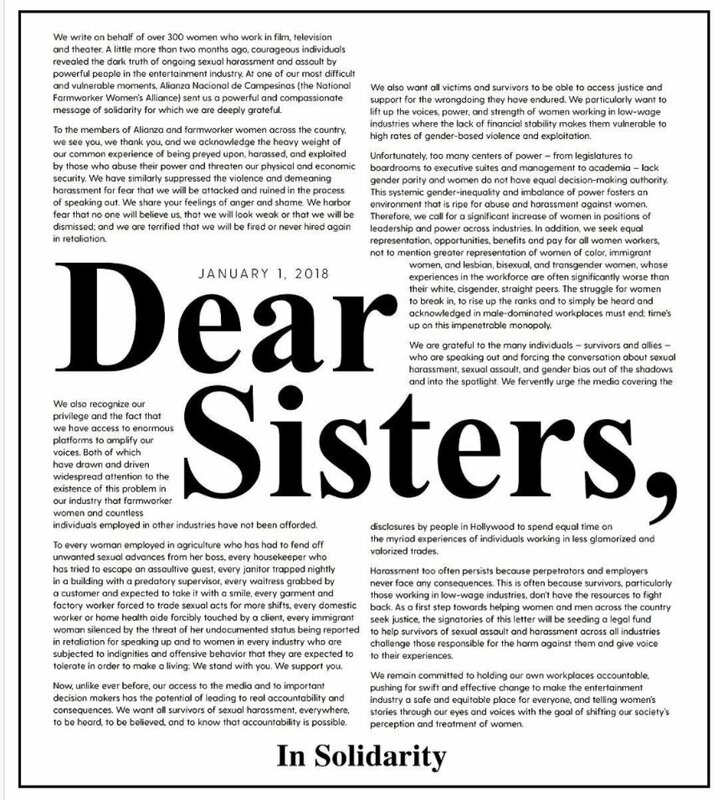 The organization's open letter, with the support of over 300 actors, actresses, directors, writers, producers, etc was released January 1st and is now on their website. There has been a lot of talk of controversy over the movement and the way they chose to go about it. The goal of wearing black was more than ruining the best-dressed competition as talk of the pre-show is often about the dresses, jewelry, and hairstyles. The goal was to take this talk and steer it towards the movement's agenda; to create equality for everyone in the workplace. Many women spoke about their personal reasons and experiences that impacted their choice to wear black to the awards. The timing is also notable. As of January 1st, it has been exactly a year since the historic women's marches took place. #WhyWeWearBlack has been talked about both controversially and in positive light, and this was ultimately the overall goal of the movement, to get society talking about the sexual abuse happening in the workplace and we need to make a change. Time's Up is only the beginning, and this demonstration was a huge step in the #Metoo movement as well as a large victory for feminists overall.